“Smart phone” can be an ironic name at times. Sure the world is at your fingertips but it comes at the price of basic human interaction. As we become “smarter” it seems like we become more distant as well. Sometimes you just need a break from the social networks and have some genuine human interaction. At our Dojang, we offer family classes that help to strengthen the bonds of your most important relationships, the one with your kids. If you are interested in learning more about our family classes, register for our trial program today! When I went to her conference, her teachers said she was disciplined, organized, courteous and a leader. Wow!! Danya has had an awesome year! I am so excited right now and I like to give credit when it’s due. She is a TOTALLY different kid than she was a year ago. When I went to her conference, her teachers said she was disciplined, organized, courteous and a leader. I responded, “No, I am Danya Flood’s mother.” They responded, “Yeah, we know!” I was convinced they were talking about someone’s kid. 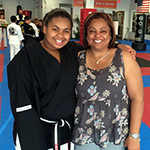 But conferring with the teachers, they correlated the timing when she was getting her black belt. They said your Dojang must be awesome. I agreed. But now I am seeing the reward. Through Tae Kwon Do my family is better able to defend itself, is in better shape, has made new friends, become more disciplined, and has grown closer. I thought that it was for my family until about six months later when my youngest son asked why I wasn’t also in Tae Kwon Do. I decided then to join since this was one of the few activities that families can do together. I have come to know, and be friends with, many other adults in the 18 months I’ve been at Master Gorino’s. 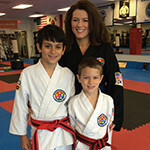 Most are in Tae Kwon Do for self-defense reasons or to get in better shape, but I joined to relate to my sons and to stay in touch with my family. Through Tae Kwon Do my family is better able to defend itself, is in better shape, has made new friends, become more disciplined, and has grown closer.